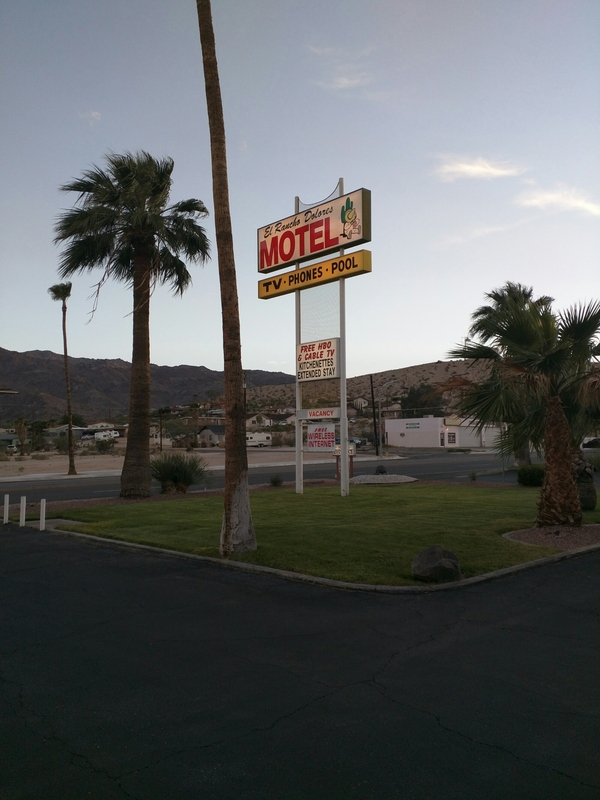 Yesterday we wandered through the California desert and through Joshua Tree National Park to end up in 29 Palms. The day turned out to be great for riding….. We would have had no weather issues if we’d trucked out for the actual 50cc. However, if we HAD gone, you know the rai would have been on display….because that’s how luck works. Highlight of MY day was finding a family owned market in Westmorland that served Date Shakes. The ride through Joshua Tree was very cool. There aren’t eroded areas of rock….its all piles of boulders. It looks like the Gods had a marbles game and just let it lie. 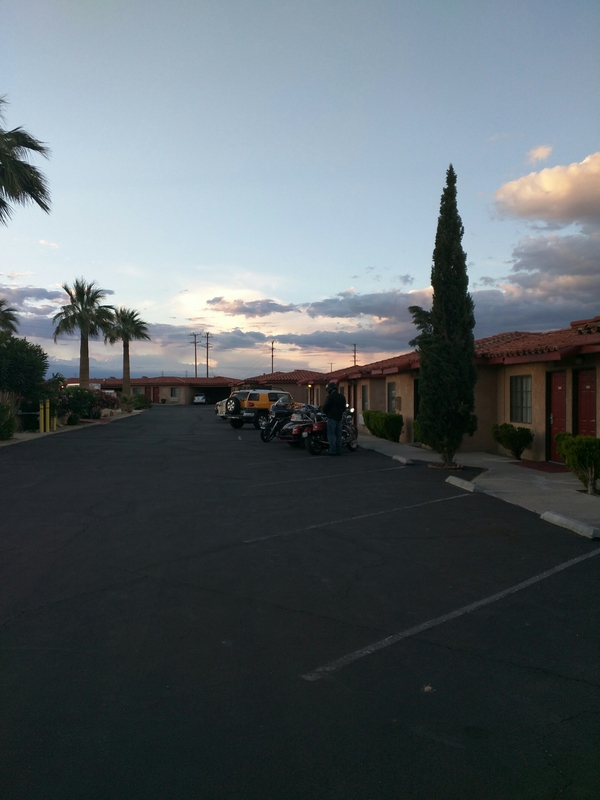 We arrived in 29 Palms around 5 and found a place at the El Rancho Dolores motel. About 50 separate rooms that are made for road travelers…..kitchenette, extra floor space…..and it is something right out if the 1950s. We also found the Palm Kebob House for dinner and introduced my dad to Kebob and Schwarma. It was sooooo gooooood! I’d have taken a picture, but didn’t out the fork down long enough. Today we go through Lake Havasu and on to Williams, AZ. Figured we couldn’t be on this trip with the English boy and not go see the London Bridge in Lake Havasu! The other groups on the 59cc have reported in and are all safe. The lead group of 5 left at 4am yesterday and look like they will make Jacksonville tonight! The second group that has 3 riders and 1 passenger split up with bike trouble…. 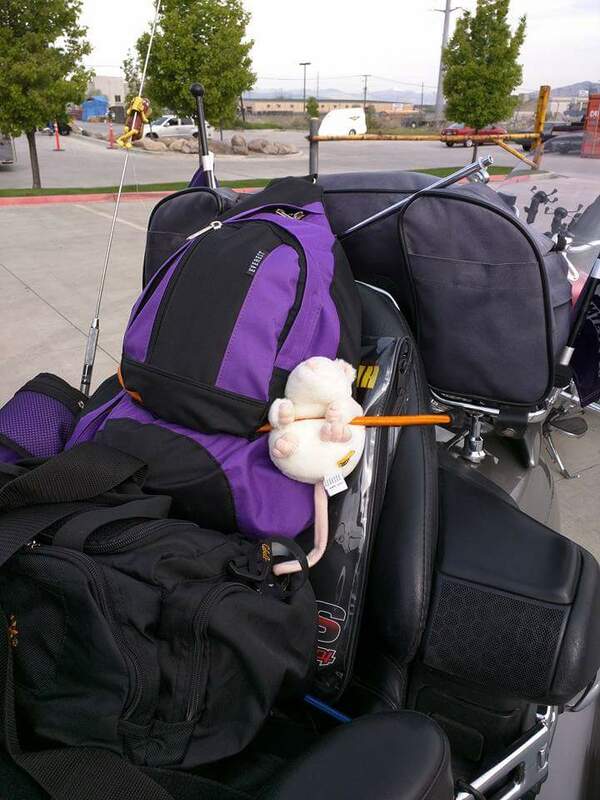 2 riders stayed in New Mexico and the rider plus passenger moved along solo. They look like they might make it tomorrow morning. So we are scattered all over this country! Time to go pack up. Report from Arizona coming later….. Phew!!! Made it it SAN DIEGO!!!! Little rain in Las Vegas. Little rain in Riverside. Otherwise nice and perfect! We were out if the heat and, more importantly, out of the cross wind. There were some headwinds, but it was more like you’d expect to have riding at 80 mph. The weather forecast when we’re prepping to depart a few days ago showed a clear route. Earlier today, it looked like we’d hit rain for our departures from San Diego and Kerrville….which is not a great prospect. Then the forecast looked better again. So the weather feels unpredictable. And that is NO BUENO! Huge thanks to Harper Wilson and Steve Bailey for being weather lookouts and providing the heads up on changes!!! When mapping out all that we had donr just to get here and all that we had coming up, exhaustion started to become an issue. Nic does not have a faring on his bike, so he gets the brunt of more than the rest of us. Having already done 1600 miles in less than 3 full days….he’s feeling it. All this adds up to a change of plans. We’ve decided that as trio we will not be embarking on the 50cc challenge. Sad panda. But the fatigue it a little too high, and the build up of fatigue will be overwhelming at the end. So….our adventure will be a-changin! We are now headed out and will be getting through the scenic sights of the southwest. Not sure of the details yet….that takes coffee in the morning to get clear in my head. But it will be an adventure! While I would love to do this challenge, I’m mostly just happy having this experience with my boys….. I wish I’d had the chance to start all of this with my dad 10 years ago, but I’ll take the opportunity now. And our efforts for Team Teve are not ending! Our flags have taken a beating and are pretty hammered….but that sort of sums up the Bailey’s situation. Pretty hammered. 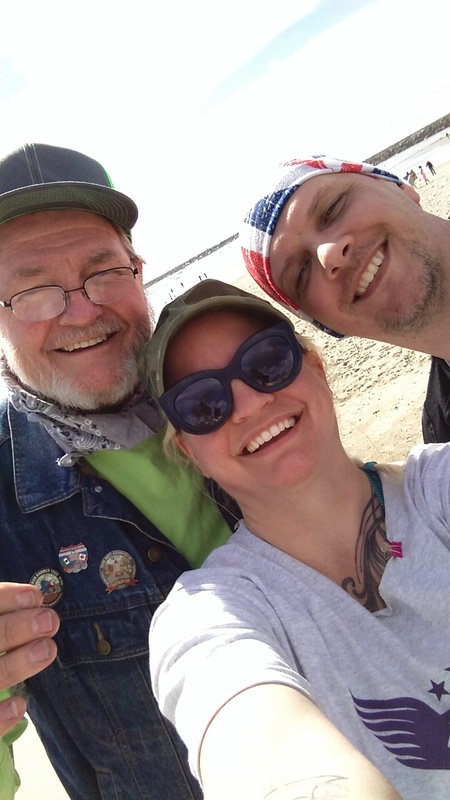 We are keeping the message out there….and there are still goodies for donators!! Keep your eyes open for the donation prizes that will be posted! 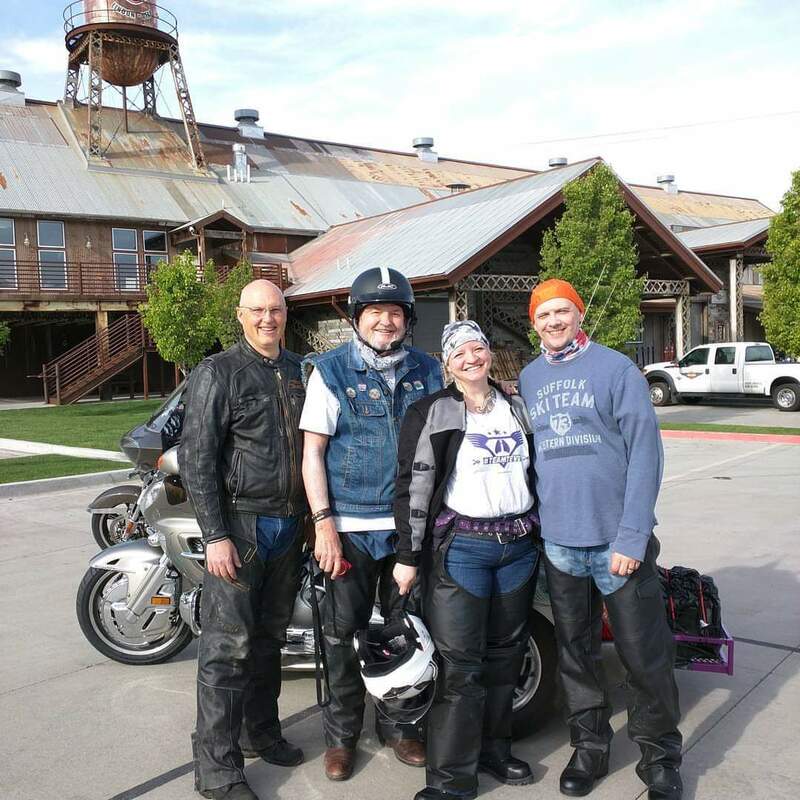 Our other teams are headed out early tomorrow…one group if 5 riders at 4 am and a group of 4 riders plus 1 passenger at 6. Watch out Texas!! Best of luck you crazy folks!! Day one is down on the books! And it’s been a long and mostly good one. Yesterday, Nic started off first. He got out of town around 7 and braved the solo drive to Utah. Good weather and pretty good times as him arriving at my parents house in Pleasant Grove at about midnight. His first day was over 830 miles, and he was back to it this morning! We were a bit behind schedule this morning with loading up, so we didn’t hit the suggesting about 10:30. 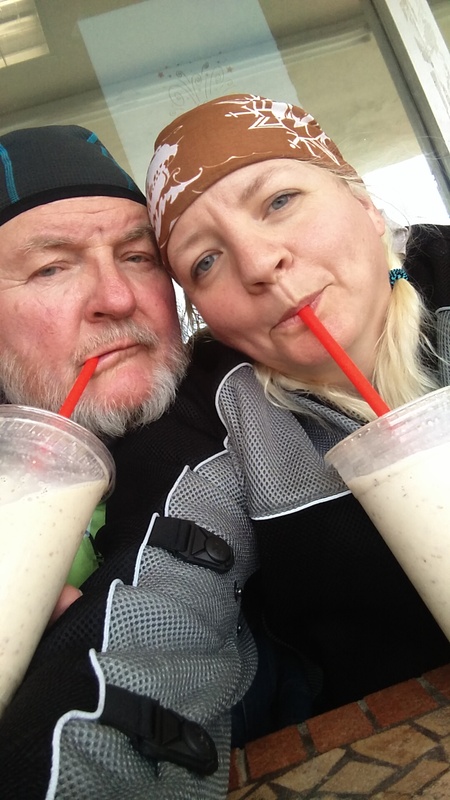 It has been a perfect day for riding…..except for the wind. The !#®\$/ wind. The trike is really heavy, so alone it’s less of a worry than a 2-wheel machine. Unfortunately, having a driver on top of a tall trike provides a LOT of profile for the wind to hit. It was tiring. However, not constant. We arrived in Las Vegas at about 2:30 in time for a lovely lunch of ibuprofen. As soon as we finished lunch (there was real food) Nic suddenly felt very unwell. Rather than risk him feeling worse, we parted ways with our other rider, Grant, and decided to stay the night in Vegas. We’ll work to catch up to the other 50cc riders tomorrow in time to depart Saturday morning. 1. Lemon Pledge is just about the best windscreen and visor cleaner around. 2. I can only get on and off the trike from one side. I am not an ambi-mounter. 5. I am RIDICULOUSLY proud of my husband. I don’t think he planned on this sort of insanity when he married me….and he’s killing like a champ! For those following along….Hostage is also a champ. He gives me a little fist bump every gas stop, and he’s not yet eaten a single bug. Hot tub and ibuprofen for dinner I think. Check you all tomorrow! Packed, sorted on the bike, and ready for a snooze before heading south tomorrow. Waiting for this to start is like being in the longest line at Disneyland….. What’s at the end is awesome but the wait is a killer!!! The flight to Utah was quick…. I slept the whole way. Nic rode the whole way today, and survived a chilly bit in the southern Idaho dark. But all is well and we are as ready to go as we can be! Posting will be light…. Please look for what we can post quick via Twitter and Instagram. Find me as Nuurdygirl on either, or look for #TeamTeve! 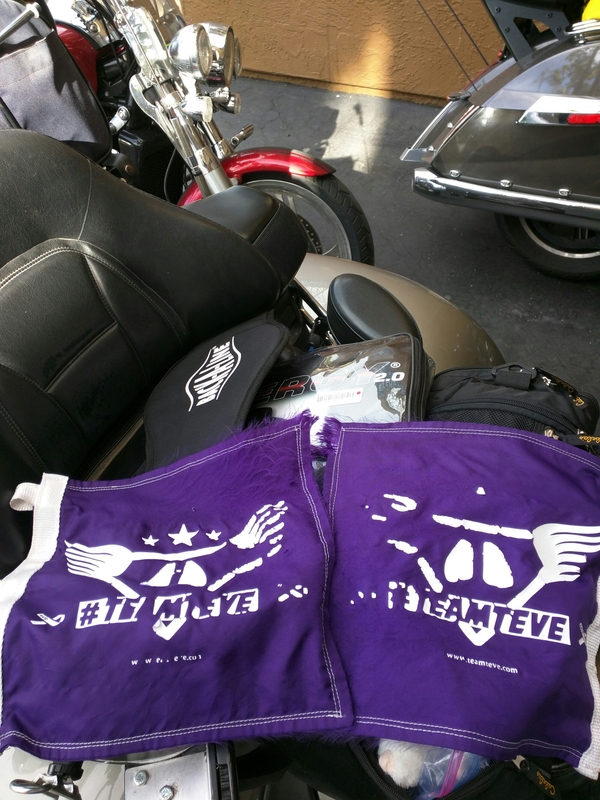 And be sure to check out http://www.teamteve.com for info on who we are raising money for and to get in a donation! The smallest donation does a work of good!!! Down to single digit days now. Pretzel and I took advantage of our last day to sleep in…then started the packing. All of the heavy, large, or awkward stuff is what I’ll actually be wearing the entire trip….just needed to pack it for the plane to Utah. I will NOT be trying to wear leather chaps, an armored jacket, and monster boots through security and on a plane. Whiskey was not a fan of the packing. I think she was trying to blend in so I would pack her, too. I can’t believe that there are less than 48 hours until this adventure kicks off. I have a combination of feelings about all of this…..excitement, nervousness, silliness, happiness, and gratitude. I’m overwhelmed with the feeling of seizing life…..when there is something you want, you go and find a way to make it happen. Except for free baggage on airplanes, apparently…. Don’t forget to get your pledges listed, and donations submitted to www.teamteve.com.